The Fool on the Hill: Inquisition: frustratingly close to good. Inquisition: frustratingly close to good. It's about time I wrote my first review of Dragon Age Inquisition. Not because I've finished it; I haven't. Not because I've explored all possible paths - I certainly haven't, almost certainly won't, and probably couldn't: this is a deep and rich game. But because I've now explored it enough to uunderstand its strengths and weaknesses to a considerable extent, and it's time to reflect on how the experience affects my own ideas about game design. finish I imagine the total time - for a single path - will be between one hundred and twenty and one hundred and fifty hours. But Inquisition is not a creative product of the same class as War and Peace. Does it merit that sort of investment? To look at it a different way, a fan of Coronation Street invests over one hundred and fifty hours a year, and Inquisition is certainly a more interesting cultural product than Coronation Street. Inquisition, like any other immersive single-player computer game, is a solipsistic, solitary, and antisocial use of time, but it's also in some ways challenging, intriguing and occasionally delightful. There have been two points at which I've very nearly given up and decided not to play any further, which I'll come to and explain. So let's get the core criticisms out of the way first. The initial load time is quite extraordinary - it takes about 40 minutes between switching my 8 core, 3.2GHz, 16Gb RAM machine on and having a loaded game ready to play. Given that if you do other things on the machine when the game is loading you risk crashing the graphics card, this is in itself a serious disincentive to playing. Inquisition is also not an open world game, although, to be fair, the area to area load times are only long the first time in a given session you visit each area. But that first load time is long - and I imagine on a machine with less RAM than mine, which could consequently cache less of the game in RAM, it would be longer. This is a BioWare game, and it suffers all the core faults of BioWare games. Despite the fact that the areas are now fairly large, they're cluttered with unclimbable barriers which seem to be there just to force you to run around further. By contrast to CD Projekt Red games, the moral decisions are clear and bland. You can play as a goodie or you can play as a baddie, but there it's never difficult to decide what to do; this is not a murky, ambiguous world. The character progression system is extremely complex and not at all immersive. And the inventory system is bizarrely wrong: a finger ring occupies just as much space or weight in your baggage as a suit of armour. It also suffers from new faults that older BioWare games didn't have. For example, the user interface to the inventory system has been oversimplified to the extent that there is not (or if there is, I haven't found it) any means to dump crafting materials from your inventory. Once you've picked them up, you have no choice to carry them until you find something to use them on. And, of course, a single sample of a herb takes up as much room in your baggage as fifty bear pelts. You can only carry on conversations with your companions when you're in 'base camp'; out in the field they won't respond to you. And so on. But the core fault - the one that almost breaks the game - is one I've blogged about before in relation to other games: Voice Acting Considered Harmful. Every line spoken by any character in the game is voice acted, and consequently, because good voice acting is expensive, most characters have no conversation at all and the majority of those that do have very little. This shows up worst in the plot line 'Wicked Eyes and Wicked Hearts', which takes place in a palace in Val Royeaux clearly modelled on the French court. There are literally hundreds of characters present - and virtually none of them can speak. Consequently, the plot line resolves to a puzzle game with too few clues, and one, furthermore, which it appears you actually can't complete unless you do something non-obvious right at the very beginning, which you cannot go back to later. That nearly broke the game for me. I have started playing again, but for the present I've abandoned that plotline. I suspect I'm going to have to do it before I can procede to act three, but if I do I'll do it with an open crib sheet in front of me, which isn't a lot of fun. But the other - and more significant - fault of the fact that most characters cannot speak is the fact that most encounters in the game can only be resolved by violence. To progress, you have to kill a lot of people, as well as monsters. There are very few opponents who can be reasoned with, persuaded, brought on-side. Most are just immediately and implacably hostile. That does not make - for me - for an engaging game. For the rest, the scenery is pleasant but - with the exception of the Skyhold Castle set - not special; again, the CD Projekt Red art team leave BioWare in the dust here. The monsters are monsters - yes, of course there are dragons and you can fight them. There is a lot of varied loot, if that's what interests you; there is a potentially interesting crafting system, if that's your bag. There are lots of different costumes, and you can customise them. I haven't really explored what the modding community has to offer, yet, but it's nowhere near as rich as the Skyrim or Witcher modding communities. So why am I still playing? Well, frankly, story. And I realise I'm frustrated by how sparsely it's doled out, how much graft I'm being made to do to earn the next snippet. The bit of the story that's caught my interest? No, it isn't closing rifts in the sky or defeating an immortal talking monster; that story is cod. The real world has neither personified good nor personified evil, and stories built on them are peurile and not worth anyone's time. The real world is like the Witcher's world, a grey world, a world of least-worst choices, not like BioWare's harsh black and white. The first time I almost stopped playing was about that. The main plot story - your own character's story arc - is that you have mysteriously acquired a unique and non-transferable magical gift, which is the only thing that can save the world from its new embodiment of evil. And the introduction to the game is entirely linear: go here, do this, go there, do that, with little opportunity for either interaction or choice. Yes, I do understand that the introduction of a game has to lead the player through the game mechanics, but that excessive focus on mechanics often leads to poor writing, and it does here, I think. So why, actually, am I still playing? The character Cassandra - in this game, anyway - is an angry, aggressive, clearly damaged female warrior (no pretty young girl), distrustful, private, emotionally closed; but clearly of strong moral principles and capable of strong loyalty. She's very well written and well voice-acted, with an accent which is at once foreign and unplacable. There's also a great deal of well written, amusing and character driven interaction between Cassandra and another non-player character, Varric. Varric is a dwarf merchant and part time writer of fiction, including romances which it is heavily implied are extremely steamy. In back-story - actually in Dragon Age 2, a game I haven't played - Cassandra had interrogated Varric with at least an implication that a degree of torture was used. Consequently, at the start of the game there is considerable dislike and distrust between the characters, which gradually thaws during the game in interesting ways. In brief, both of these were well-drawn characters I quickly came to appreciate. I believe that some of the other companion characters are probably equally well drawn, but they haven't interested me so much so I haven't interacted much with them. At the point I was seriously considering abandoning the game because I was utterly frustrated by 'Wicked Eyes and Wicked Hearts', I browsed the Dragon Age wiki (moderated by my old friend and companion in crime Carrol Dufault) to check on a few things which might help me to decide whether to continue. I discovered that Cassandra was 'romanceable'. There have been romanceable characters in a number of BioWare games, and I'd assumed there would be in this one without a great deal of interest. Romanceable essentially means that there's a plot variant to be discovered which allows the protagonist (that's essentially you) to have a romance with the character. For Cassandra to be romanceable has to give her a very interesting story arc, to develop in unexpected ways; and that thought is keeping me playing. I also do want to see the further development of her odd freindship with Varric. In summary, this game isn't the equal in plot or setting or art or dialogue or even character to any of the Witcher games (although it is considerably easier to get into than either Assasins of Kings or Wild Hunt), and it isn't nearly as ambitious as Skyrim, but may have better character and plot. But it's interesting, intriguing, and a lot of the story is well written. Yes, it has been worth the ninety hours I've spent so far. 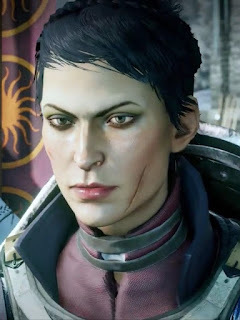 I shall almost certainly complete Cassandra's story arc, because I want to know what happens; whether I'll play on to the end... well, we'll see.